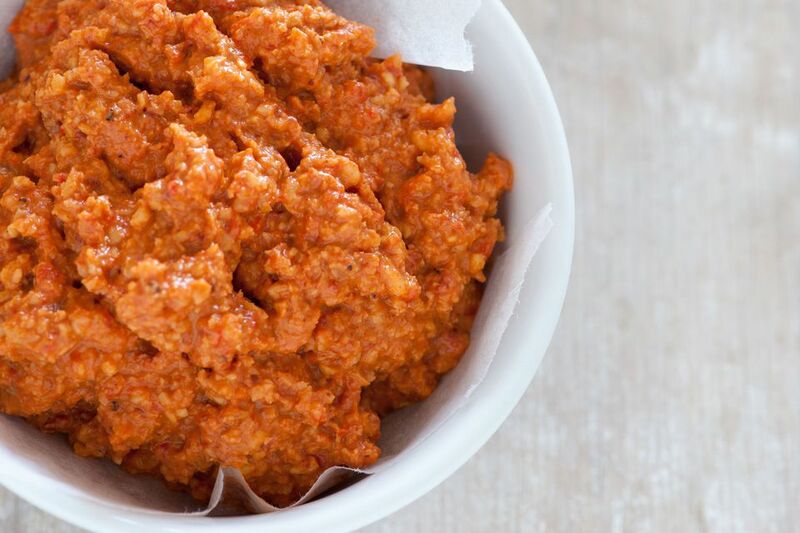 Muhammara, a name derived from the Arabic word for reddened, is a spicy red pepper and walnut dip. It's origins are Syrian but it's now found all over the Middle East and Turkey. There are plenty of variations but the most common ingredients are olive oil, walnuts, breadcrumbs and fresh or dried peppers. Other frequently used ingredients can include spices like cumin, mint, garlic, lemon juice and even pomegranate molasses. It is easy to make and can be served warm or cold. I like it as an alternative or secondary option to regular hummus and it's great to make ahead for a party. Serve it, as you would hummus, in a bowl with toasted pita wedges, fresh veggies or anything else you'd like to dip. I also love hummus as a spread on sandwiches and muhammara works just as well and adds a fabulous little kick. Because it's such a flavorful dip, it also works well as a sauce for meat, chicken and even fish. This particular muhammara recipe is not too spicy and perfect for beginners. But, while it may seem a bit intimidating at first, once you start making this dish, you'll find your perfect balance of ingredients to suit your taste. Enjoy! Place the whole red peppers on greased baking sheet. In the meantime, place the breadcrumbs in a food processor and add 2 tablespoons of cold water. Blend to make a puree. Remove the peppers from the oven and peel off the skin. Cut open and remove the seeds. Cut into pieces and add to the breadcrumb mixture in the food processor. In a small saute pan, saute the diced onions until lightly browned. Add the sauteed onions and olive oil to the food processor and blend to a dip consistency. Add the remaining ingredients and blend, adding olive oil as needed. Remove from the food processor and place in serving bowl. Serve with pita wedges, veggies, or use as a dipping sauce for kebabs. Note that you can also toast the walnuts in a dry skillet for about five minutes for extra flavor.